As a kid, I had a lot of happy Christmases. When I was 5 I got a tiny little bird's nest with eggs that I could hold in one hand. When I was 7 we got an Atari, complete with Pacman. When I was 8 or so, I got a Snoopy Snow Cone Machine. When I was 9 or 10, I got this thing called the Animator (that I had wanted for ages!). All little material things that made me so happy as a kid. But none of those could touch the magic of the gift I got when I was 13. A gift that wasn't even a surprise - I'd gone myself to pick it out and be fitted. At Dominion Saddlery I'd swung my leg over saddle after saddle, settling in to feel the fit and decide if it was right. We couldn't afford the esteemed Crosby saddles, but I hoped to find one that was well made and comfortable. I finally found one that was just right, by a newer brand called Collegiate. 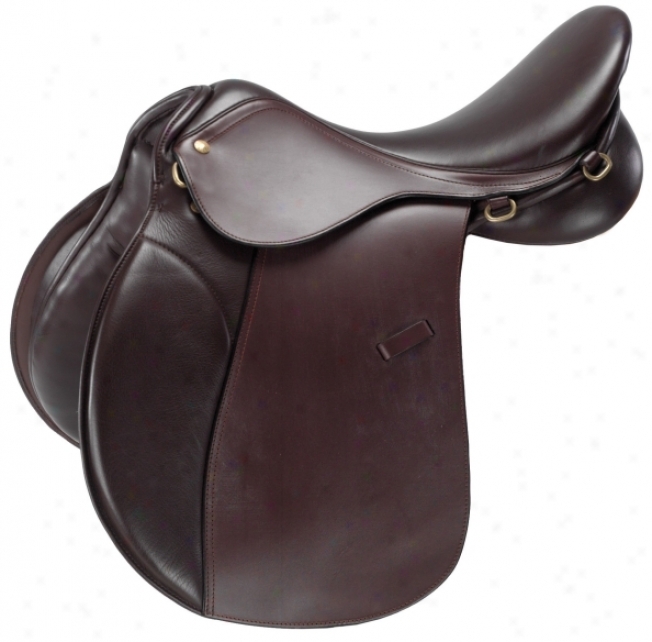 It was an all-purpose saddle - perfect for hunters, jumpers, eventing or lower level dressage. In a dark chocolate brown, I breathed in the sweetness of leather as I ran my hand gently over the perfectly sloped soft back. After six years of intense horseback riding the day had finally come that I was going to have my own saddle. My parents let me pick out stirrups and leathers to match, and saddle soaps, sponges, and this magical oil called Hydrophane. And then, all that was left, was to wait for Christmas. On Christmas morning while my brother demolished the living room with his various Star Wars characters, I lovingly applied coat after coat of Hydrophane to my new saddle, watching in awe as the leather drank in each drop of oil, darkening from the moisture. The smell of the leather was more beautiful than gingerbread men or sugar plums or pine trees that year. I ran the stirrups up and down, I sat in the saddle over the arm of the couch. And finally, we took the saddle out to the barn to put it on my horse, Chico. No longer would I have to borrow the beat up, ancient and cracked-leathered schooling saddles. Finally, I had my Collegiate to place in my tack locker. The saddle was a perfect fit for me. Over the years, it went to more hunter shows than I can count. It went on trail rides and cross country eventing. When it came time to leave for college, my saddle traveled with me, still supple from the oils I'd applied, still lovingly tended and polished. In Texas, even though my friends rode Western, I stuck with my Collegiate, a second skin to my riding - without my saddle I felt unbalanced and uneasy. The Collegiate rode in parades and through gravel pits, it was witness to rattlesnakes and broken ribs and on one occasion an attack by hundreds of angry swarming bees. And after each ride, it was tended and oiled and properly stored away. Toward the end of college, it again traveled to a few horse shows, and once even went to the beach. When the sojourn in Texas came to an end, the Collegiate returned to its roots in Virginia, a little more scratched (a certain wayward horse tried to take a bite out of it), the threading a little more worn. But still it was loved and cherished. And still, it came out of the tack shed for rides - sometimes through the mountains, sometimes for lessons, but mostly just for rambles about the arena. The Collegiate is still in use today. Although I have a dressage saddle, and a Western saddle (from my Texas days - they made me! ), the Collegiate All Purpose is still my saddle of choice. I can't think of any other gift I've received that was so dearly loved and still holding strong, some 23 years later. This was beautiful, Lisa. I know nothing of saddles but it sure is beautiful. I can almost smell the leather while reading this. I don't think I have ever wanted anything as much as you wanted that saddle. I am sitting here trying to think of my most memorable gift (besides the birth of my daughter) and nothing comes to mind. The saddle has lasted for such a long time. It sounds like a perfectly wonderful gift. That is a wonderful story! Believe it or not ,my best Christmas was last year when my Hubby bought me my spinning wheel,something I have wanted since I was a young girl! I'm still waiting on a gift that fabulous!! As I think back over the years, I really think the best "gift" was all of us being together. My memories are year after year of all of us in the living room, eating, opening presents and just being together. I don't recall the individual gifts but I remember the family together. Great story and your words convey your love and appreciation for that gift. I never had a gift last as long, other than some moosehide slippers my kids gave me. I let them go after being told they looked tacky. Now, that is one sweet story, I love it!! Your life is so different from mine, I have never rode more than a pony, but your beautiful story made riding come to life for me. A great gift that your parents really got their money's worth on! I love that you STILL have it and use it! You are a great writer! The first gift that came to mind was probably my letterman jacket. It meant a passage of age, a new stage, a belonging. How wonderful. I think it is awesome that you grew up riding. I've only been a few times. My husband has a gordeous saddle in his office on a saddle holder. He always wanted to be a cowboy and just wanted to own a saddle. Great story! You can't get much better than a well-fitting saddle! Nothing like a smell of new saddle. And the one that fits is a dream come true. Your writing is beautiful. What a beautiful story! Yah for your gift- how awesome! How wonderful to have a gift you've treasured so much over the years! I recall the My Little Pony castle making a huge impression - my family didn't have much money growing up and I never expected something so amazing. My mom found it at a garage sale in nearly new condition and had saved it until Christmas for my sister and I. It was a great present! Gosh, what a story, and you STILL use it? How wonderful. I think for most people, their best memory of a Christmas gift is just that, only a memory. This should be handed down in your family, is this the real one in your picture? It looks brand new, so maybe not? I am betting with Pierce, even though I do NOT want any snow!! He is just TOO cute to bet against! Oh that saddle is a treasure sweetie. I can almost smell the leather through the screen. You must of been thrilled to death! I've had so many it's kinda hard to pick one. The first one that popped in mind was the Hokey Pokey Cotton Candy Machine. Oh how many time I burnt my little finger meltin' sugar for this one! Heeehehehe! God bless ya sweetie and have a beautifully bright Christmas with those you hold near and dear! The only gift that comes to mind is the huge sliding board (to go with my swing set) that my parents got me. The had to somehow get it to the side porch --leaving a note from Santa that it was too big to come down the chimney, and where it was.... That was one Christmas that I will never forget... Santa was so good to me!!!!! I am a new reader! I am not a horse rider so I am amazed at the longevity, but I have heard my clients talk about their saddles and how important they are. I love things that last. I cannot remember and favorite gift or anything that gave me such comfort for so long! What a lovely memory, you have it stored so well that you draw the reader into that room as you lovingly rub those oils ... just lovely! I learned things about you I didn't know. A saddle IS a very special gift. And that is one cool saddle! My most memorable gift was a hamster residing under the tree on Christmas Eve. Sounds silly I know, but I so wanted that hamster! lol How great that you still have this saddle. I certainly don't still have that hamster. Beautiful post! You made me want a saddle and I don't even ride! My ultimate gift as a child was the year I knew I was getting a Cabbage Patch kid. I looked in the back of my parents closet and saw it! But then! I got TWO Cabbage Patch kids that Christmas! I couldn't believe it! This is a great story to share. It goes to show if you take good care of something and cherish it, it will last a good long while. I work with leather, so I can relate to that wonderful smell! Such beautiful memories. I also received a very special saddle that I still own. A saddle from Colombia. Given to me by a very special friend. I really enjoyed your post. I loved your story. A gift I treasured was my very first clock radio. It still works! WOW! That's a gorgeous saddle. I'm like everyone else, I can smell the leather too! I love this post. I, too, loved the saddle I received one Christmas! Anything horse related made me happy. The best gift was a belated Christmas gift that I received on January 8th of 1993-my horse!